Amr Hamzawy was one of the few liberals who condemned both the Morsi government’s misrule and the military coup. Now he’s increasingly isolated. Amr Hamzawy was once the toast of the town among Egypt’s liberal elite. A prominent political scientist and scholar, he rose to fame following the launch of the 2011 revolution, emerging as the spokesman for the “Committee of Wise Men,” an ad hoc coalition of public figures formed to mediate between protesters and the Mubarak regime. Hamzawy went on to help found two liberal political parties before winning a seat in Parliament, soundly beating a Muslim Brotherhood candidate in one of the strongest showings in the 2011 elections. His liberal politics often put him at odds with the Brotherhood and other Islamist groups during their time in power. He was a frequent guest on television talk shows and a regular public speaker. But it was Hamzawy’s outspoken criticism of the army’s overthrow of elected president Mohamed Morsi last July that set him apart from his liberal counterparts. 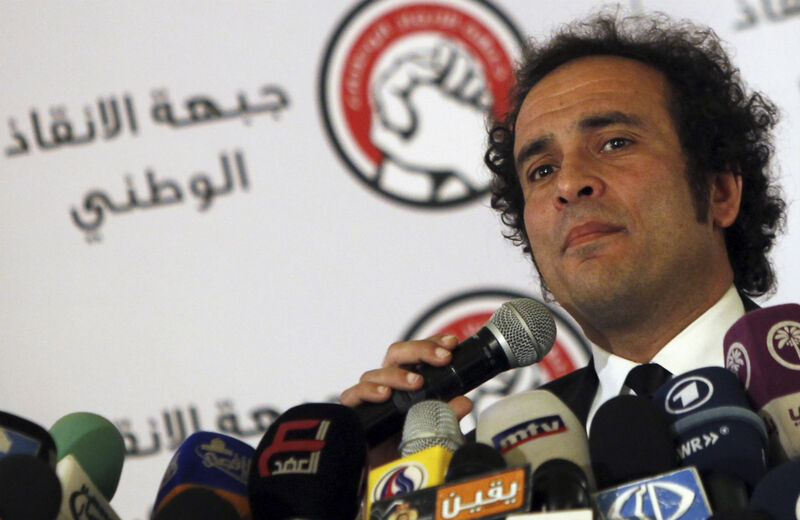 Now, three years after the revolution began, Hamzawy finds himself politically isolated. He is vilified by his former colleagues, branded a traitor and a “fifth columnist” in the press and barred from travel after prosecutors charged him last month with insulting the judiciary. “It’s hard to be with no allies and no friends, but it’s always better to understand where people stand and what they think in order to mind future steps and maybe fashion new alliances,” Hamzawy said in a recent interview in his small office at the American University in Cairo, where he is a professor of public policy. In the aftermath of last summer’s coup, while much of the political elite fell over one another to praise the military’s role in ousting Morsi and the ensuing brutal crackdown on the Brotherhood, Hamzawy emerged as a rare non-Islamist critic of human rights abuses by security forces, the quashing of dissent by the interim government and the re-entrenchment of the military into public life. Yet on July 3, three days after the demonstrations, as massive crowds in the streets cheered on the military, Hamzawy was arguably the only prominent liberal figure in Egypt to oppose the army’s role in removing Morsi from office. “You should open up polities in transitioning countries to an early ballot box, but not for interference by a military and security complex,” he said, pointing to examples in other countries, like Argentina in the early 2000s. Hamzawy argues that if Morsi had agreed to hold an early presidential vote, and if his liberal counterparts had not compromised on democratic principles, then the military coup could have been avoided. Since Morsi’s ouster, hundreds of protesters have been killed and as many as 21,000 people have been imprisoned, according to Wikithawra, a group that documents detentions. The crackdown has broadened well past the Brotherhood, with activists, journalists and academics being targeted amid the narrative of a war on terror. Throughout it all, Hamzawy has remained an outspoken critic of the military-led roadmap and the growing government campaign to silence all expressions of dissent. In mid-January, prosecutors charged not only Hamzawy but two dozen others—including liberals, Islamists and Morsi himself—with insulting the judiciary. In Hamzawy’s case, the charges stem from a message he posted on Twitter last year criticizing a court ruling against three US nonprofit groups. The charges came the day after the adoption of a new constitution that was hailed in the media as an important step forward in the political transition. “What is happening in Egypt politically is a move away from democratization,” Hamzawy says. Last month a prominent scholar critical of Morsi’s overthrow, Emad Shahin, who has taught at Harvard, Notre Dame and the American University in Cairo, was charged, along with senior members of the Muslim Brotherhood, with espionage and subversion. The case sparked an international outcry, yet was met with a muted response within Egypt. There is little criticism of the military in the state and private media, many of which have helped to whip up a frenzy of chauvinistic nationalist sentiment. Belal Fadl, a popular columnist and fierce critic of the interim government, recently decided to quit writing for the private daily Al-Shorouk after the newspaper refused to print his article critical of the military’s intervention in politics, in what he called an act of censorship. Yet the army and Sisi enjoy widespread popularity, and the army-led crackdown on opposition voices is often either encouraged or ignored. Hamzawy said the public’s response is not surprising, pointing to the failure of the entire political class to address people’s needs in the wake of the revolution. The charges against Hamzawy do not disqualify him from running again for Parliament, but he is undecided and said he needs time to assess whether he can most effectively challenge the growing authoritarianism through formal politics, as a lawmaker, or informal politics, as an advocate. Watch Next: Sharif Abdel Kouddous on Egypt three years after the revolution.